Big Ed Delahanty was baseball’s defining slugger of the late 19th century. A hard-swinging, hard-living man, Delahanty was an exceptional hitter, eclipsing a .400 batting average three times in a 16-season career. The Cleveland native was a well-rounded player, leading his league in categories as wide-ranging as stolen bases (58 in 1898), homers (19 in 1893 and 13 in 1896), and hits (238 in 1899). 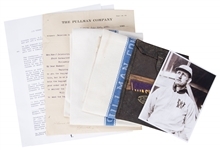 Delahanty enjoyed his greatest success with the Philadelphia Phillies, although he also turned out for the Cleveland Infants of the Players League and the Washington Senators of the upstart American League. While Delahanty’s playing career is as impressive as they come, his modern legacy is dominated by the tragic and mysterious circumstances of his death in 1903. 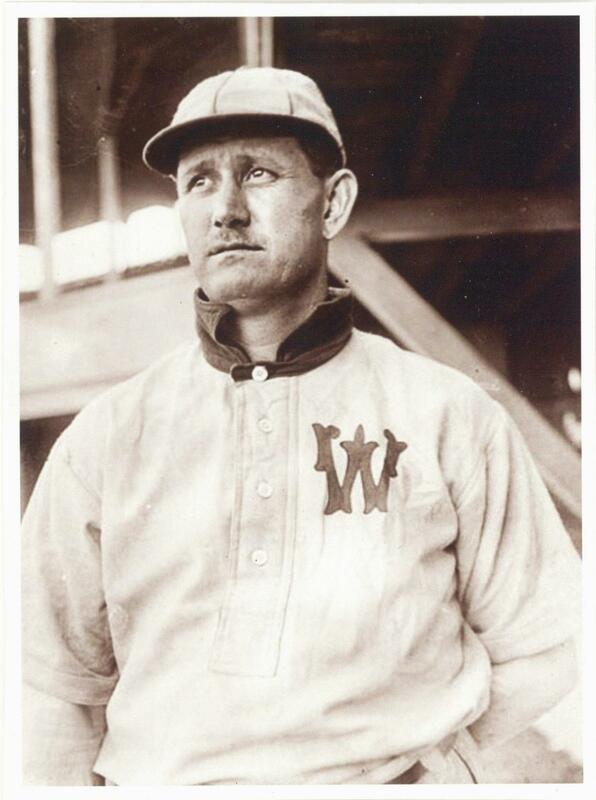 While playing for the Washington Senators, Delahanty boarded a train from Detroit to New York, where the 35-year old planned to jump to the New York Giants of the National League. Delahanty, his behavior becoming more and more erratic as the season progressed, became increasingly inebriated on his train ride to the East Coast before being expelled from the train near Niagara Falls. 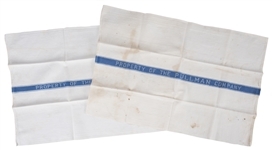 In the middle of the night, drunk and lost, Delahanty tumbled, jumped, or otherwise fell from the International Railway Bridge after a scuffle with the night manager, landing in the frigid depths of the Niagara River. His body washed ashore at Horseshoe Falls in Canada a week later. In 1945, Ed Delahanty would be inducted into the National Baseball Hall of Fame via the Old Timers Committee. 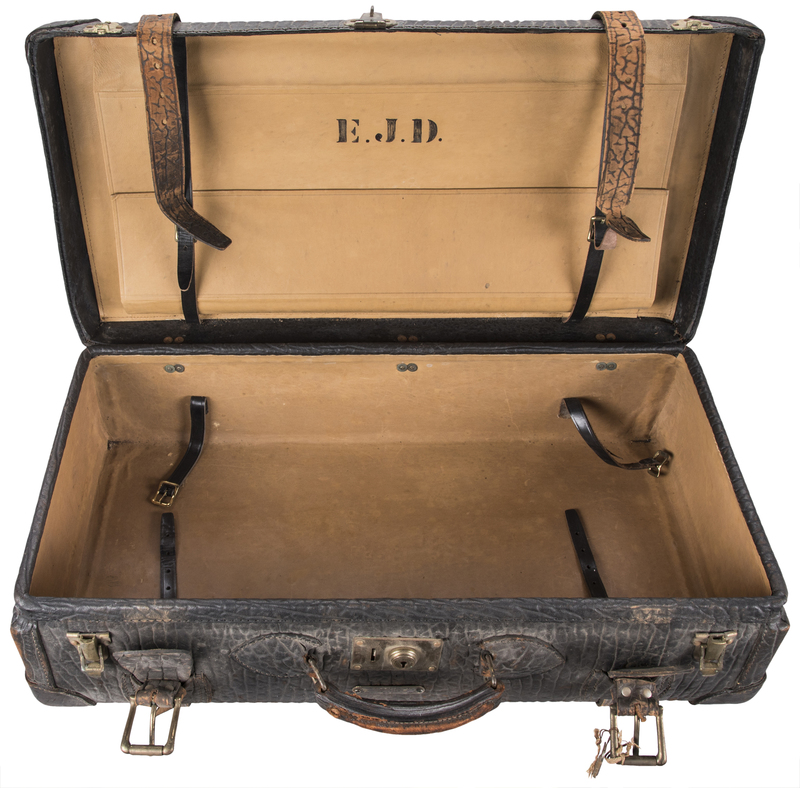 Offered here is Delahanty’s suitcase from his fateful Detroit to New York train ride. 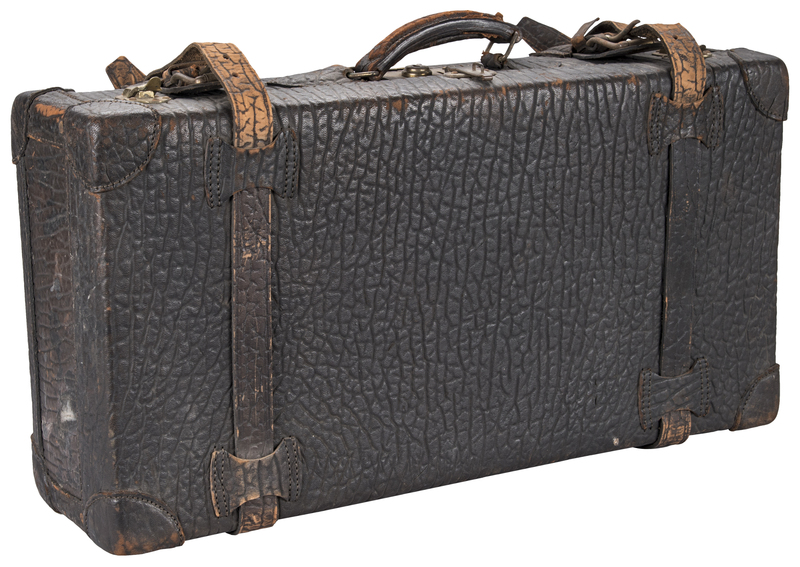 The textured suitcase measures 26 x 13.5 x 8 inches and features two buckles and three clasps on the front. 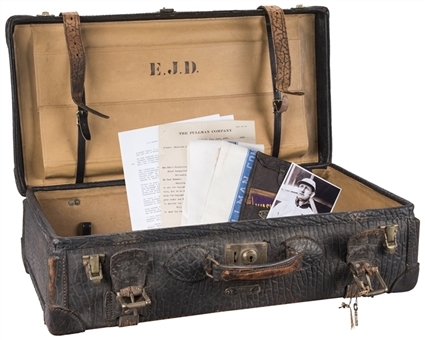 A small placard affixed to the front of the suitcase reads “Mr. Ed J. Delahanty Washington Senators B.B.C.” and “Please Return to Owner Reward”. 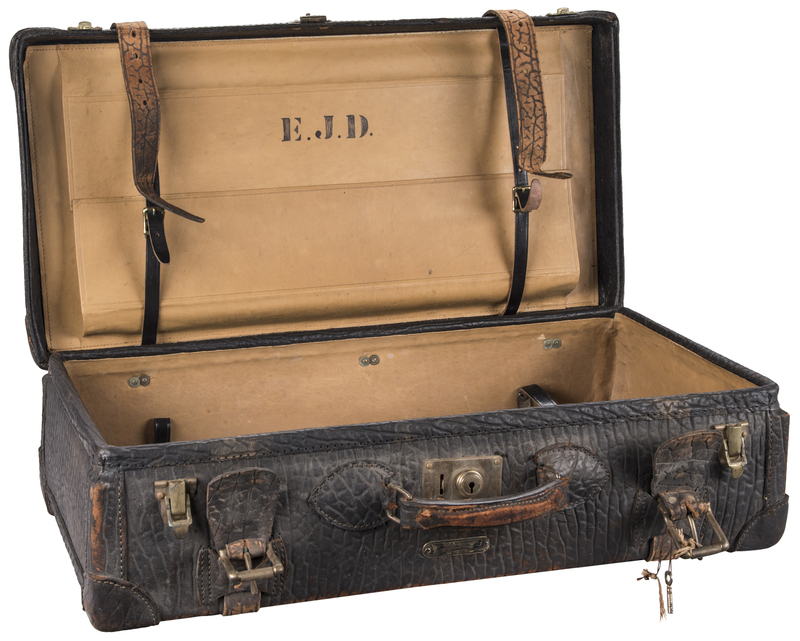 The inside of the suitcase is tan, with the initials “E.J.D.” stenciled in black on the inside of the lid. 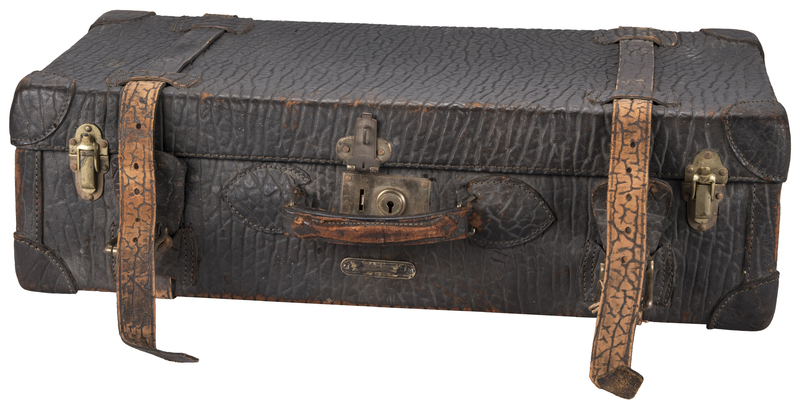 The suitcase is accompanied by a letter from the District Superintendent of the Pullman Company addressed to “Mrs. Edw. J. Delehenty [sic]”. 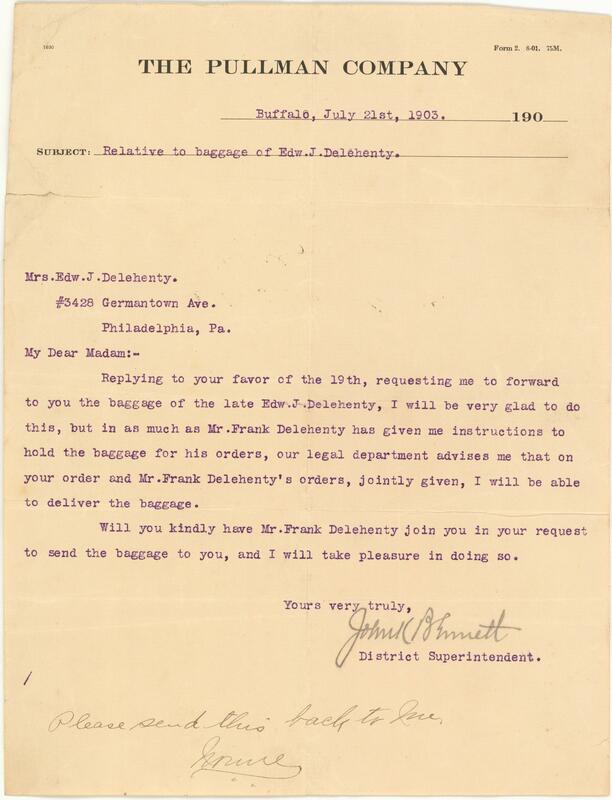 The letter states that the deceased Delahanty’s baggage and personal possessions were to be delivered to his widow per the joint approval of his brother, Frank. 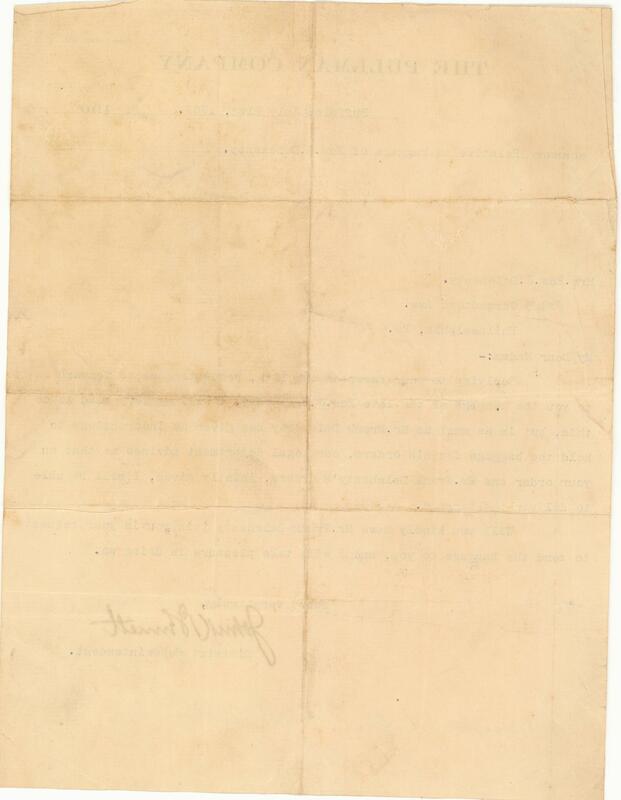 Handwritten at the bottom of the typed letter is “Please sent this back to me / Norine”. Norine was Ed Delahanty’s wife, living in Philadelphia at the time. 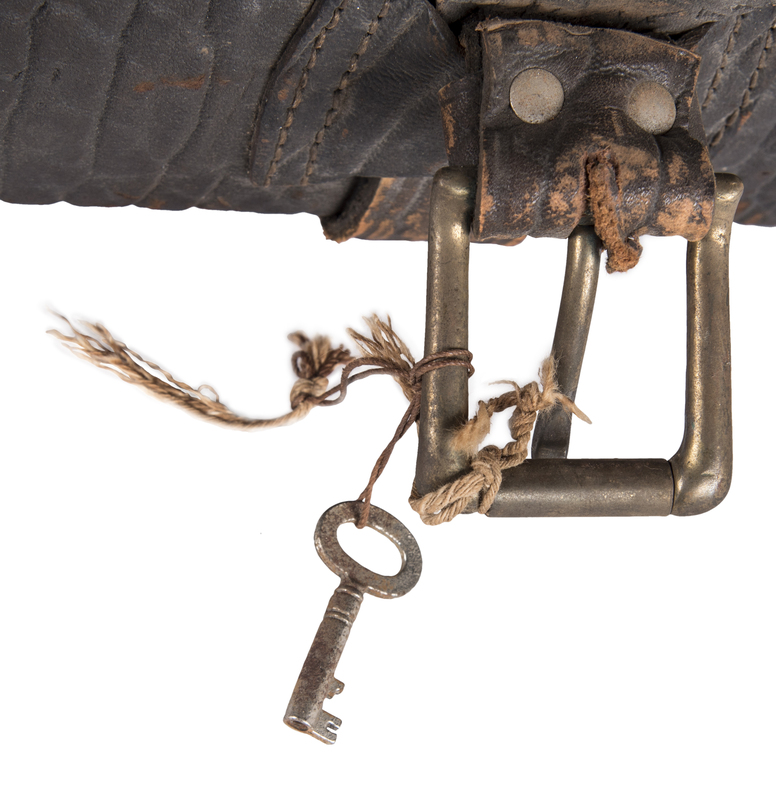 Also included in this lot are several of Delahanty’s personal possessions recovered from his belongings. 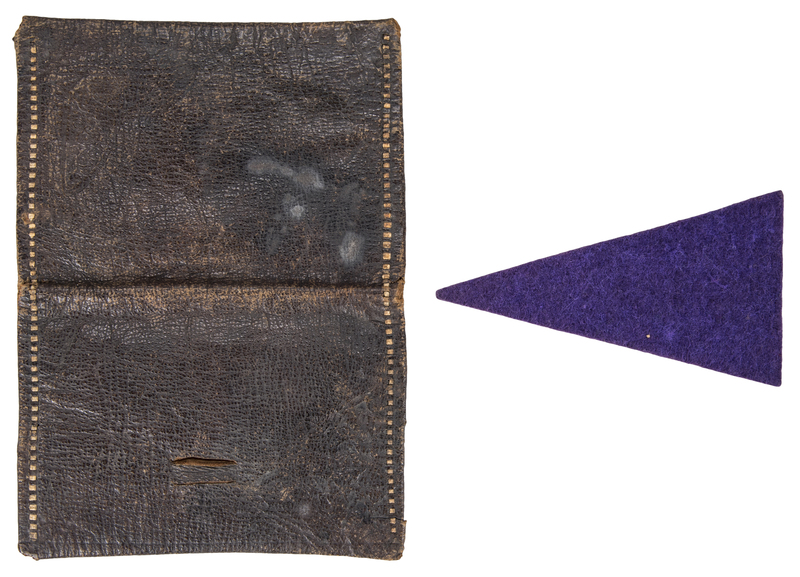 The first item is a bifold leather wallet. 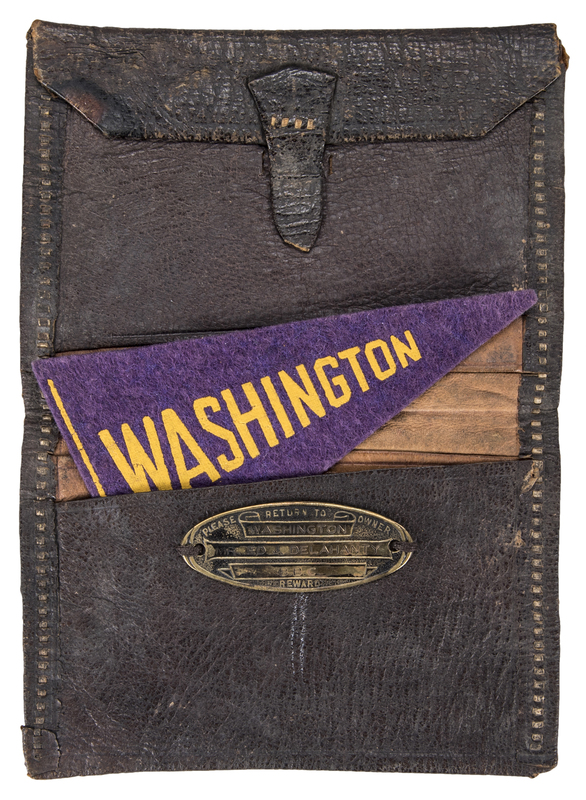 A plaque on the inside of the wallet reads “Please Return To Owner / Washington / Mr. Ed J. Delahanty / B.B.C. / Reward”. 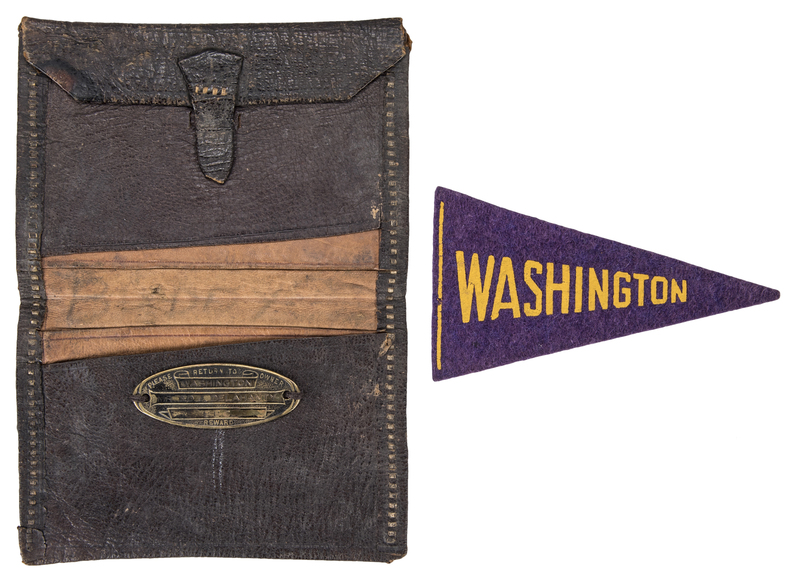 Along with the wallet is a purple Senators pennant printed with “Washington” in yellow. 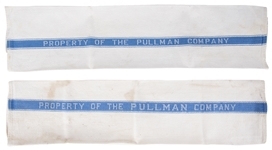 The pennant measures 4.25 x 2.5 inches. Finally, two white cloth napkins are included. 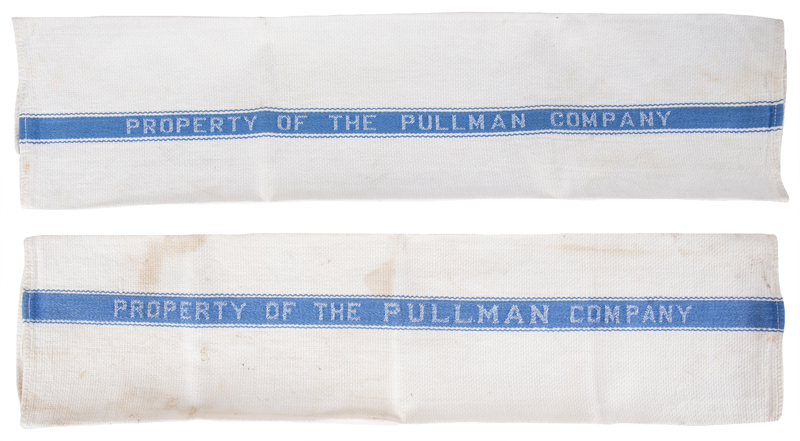 A blue stripe embroidered with “Property of the Pullman Company” runs across each napkin. 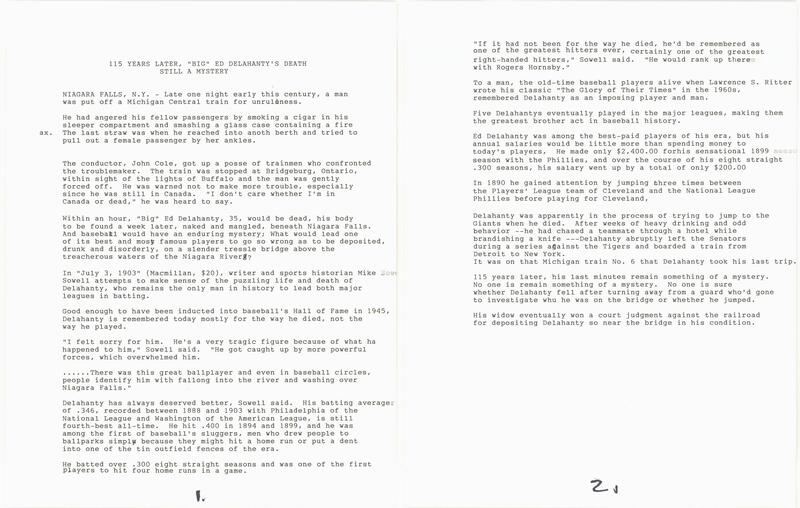 This lot is a true piece of baseball history, from one of the most intriguing and excellent baseball players to ever grace a diamond.